After prototyping the pedal-powered shredder machine during the garden hackathon in 2017, we have realized the potencial for such devices to combine exercycing and caring for a community garden. These spaces for urban agriculture play an important role in bringing together citizens of big cities worldwide to reconnect with their natural resources and to provide the neighborhood with healthy and fresh food. Nevertheless, there is a lot of hard work involved in it and, at least in Brazil, those spaces are mostly cared by women. Engaging the local community in helping them usually proves to be a challenge, so we came up with a innovative strategy to involve neighbours by giving them access to exercising and socializing while getting hands on to care for the garden. The proposal consists of a series of gym equipment that are low cost agricultural machines moved by human energy such as: the pedal-powered shredder machine, a manual water pump, a sifting station, a two man shovel, a double bucket and digger shoes. Together they form an 1 hour exercising circuit to make neighbors sweat and have fun together. 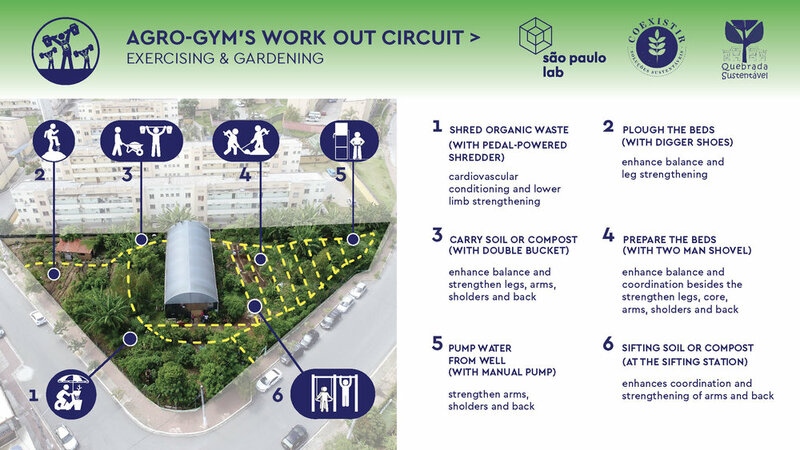 São Paulo Lab together with Co-Existir and Quebrada Sustentável have been awarded a grant by Jatobás Institute to organize a collaborative design marathon to build the Agro-Gym. 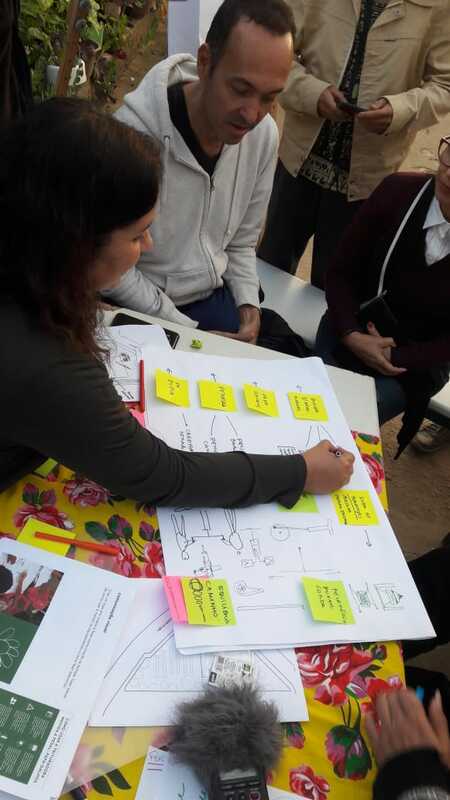 The two part program happenend in May (Ideation) and August 2018 (Prototyping) and involved neighbours, designers, urban farmers, students and makers into designing and building the equipment that has been installed on a community garden on the peryphery of São Paulo called Viveiro Escola União and the neighborhood exercising groups will start to use it in early September 2018. AVISO: Os projetos de cada equipamento com as instruções de construção passo a passo serão compartilhadas open source futuramente. Se você possui interesse em replicar estas soluções por favor envie um email para magu@saopaulolab.cc e lhe informaremos assim que o material estiver editado e carregado.